La Perm cats hail from Oregon in the United States of America. In the 1980's on a cherry farm in the The Dalles, Oregon a brown shorthaired tabby produced a litter of 6 kittens. One of the kittens was bald, with a 'blue print' tabby pattern on her skin. Richard and Linda Koehl, the family who owned the barn cats, were surprised that the kitten survived. They were even more astonished when, after 8 weeks, the little 'baldy' began growing a coat - a silky-soft wavy coat. They named the kitten Curly. The Koehls knew nothing about feline genetics and it never occurred to them that Curly was unique. Their free-roaming barn cats continued to produce curly-coated kittens for the next ten years. Finally the Koehls consulted with people-in-the-know. It was established that the curly-coat was the result of a spontaneous mutation by a dominant gene. 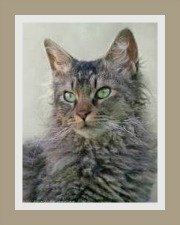 Curly, the individual that she was, had unknowingly produced a small colony of curly-coated cats that would later form the base for a controlled breeding program and the establishment of the breed! 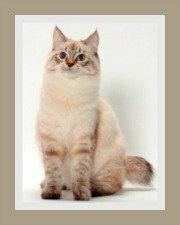 When the Koehls finally showed this unique cat breed, they were totally unprepared for the positive reaction this domestic cat would receive. 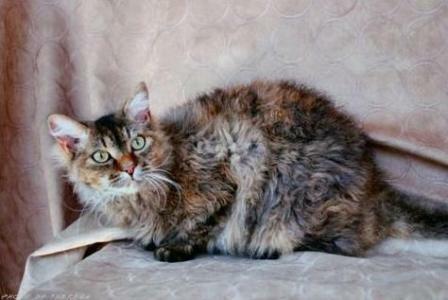 The Koehls named their cats, La Perm, a French word, meaning wavy or rippled. 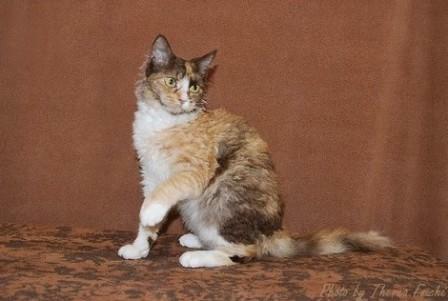 The La Perm aka Alpaca cat, or Dalles La Perm as it should rightly be called, was recognized by The International Cat Association and the Cat Fanciers Association in 1996. 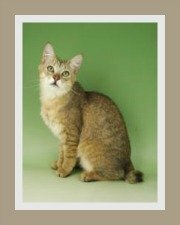 The first cat was exported to the UK in 2002 and received recognition at the Governing Council of the Cat Fancy in 2004. 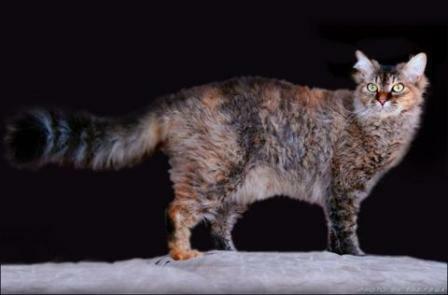 They are rare cat breeds that are still under development, but are quickly gaining popularity across the globe. The coat is light, springy and airy. The texture of the hair can either be a soft curl, wavy, or tight ringlets, but all remain soft and bouncy and the hair stands away from the body. It's important that the coat is free of matting, so it should not be too heavy or thick. The whiskers and the hair inside the ears may also be curly. The tail is furnished with curly hair. Mature males and female cats can have a ruff on the neck. There are seasonal variations in the length and fullness of the coat. This variety of La Perm has a coat that is wavy on the belly and back and the hair is short to medium-long. It has a moderate undercoat and here too the hair is light, airy and springy. The texture may be a little harder than the longhair variety. The tail is like a bottlebrush. Note: Kittens can be born hairless, or with wavy or straight hair. At about 2 weeks, some kittens go totally bald, but the hair does grow back and is always curly. Coats can range from a soft curl to tight ringlets. 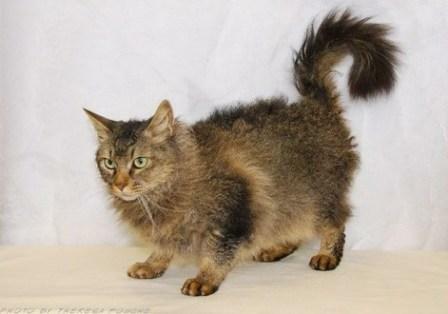 La Perm cats are medium sized, muscular cats and are surprisingly heavy for their size. Their tail is slender and long and their legs are also medium long and in proportion to its body. The head is triangular in shape, with gentle contours, high cheeks, moderately long nose, broad muzzle and a strong, firm chin. 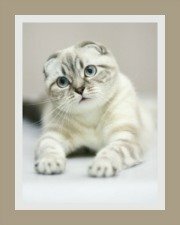 They have large expressive eyes are that are almond-shaped when relaxed and round when alert. There is no relationship between the color of the eyes and the coat color. Their ears are medium to large and furnished with curly hair inside and out and lynx tips are preferred. La Perm cats are not totally suited to indoor living. They are moderately active cats that require some exercise and a safe, enclosed and escape-proof garden to allow them to explore. Indoor cats need to be provided with an 'adventure zone' that includes cat gyms, scratching posts, toys and places to hide. You will need to avoid boredom. La Perm cats are child-friendly cats, but younger children need to be taught that cats and kittens need to be gently handled. These cats get on well with other cats and cat-friendly dogs. 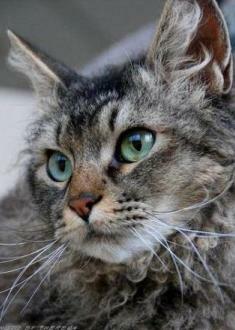 La Perm Cats are described as gentle and gregarious cats, who adore human attention. They enjoy being stroked whilst they lounge on a warm lap. If ignored, they will rub themselves against you and stroke your face with their paws. They are extremely demanding and beg for attention. Don't be fooled into thinking that this is a lazy lounge lizard! These cats are inquisitive, intelligent and can be active too. They are extroverts and have perfected the art of hunting. (Not surprising since their ancestors were free-roaming barn cats known for their hunting skills). These curly-coated cats do have an affinity for water and playing in the rain! You will be pleased to know that these cats have soft voices which they use sparingly. Their coats need to be brushed at least once or twice a week. 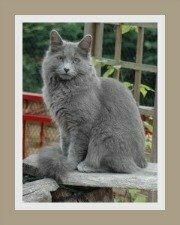 La Perm cats are robust cats with few if any known health problems. 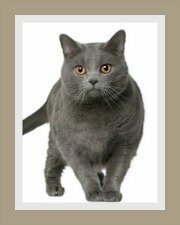 They had an excellent genetic start as a result of their origin from hearty, free-breeding barn cats. Annual vaccinations, deworming and dental check-ups, coupled with a healthy diet and exercise will ensure that your cat remains healthy. The La Perm needs a well balanced diet which should be the best cat food you can afford. Cats drink water, not milk, so do make sure kitty has access to clean drinking water every day. The average life span for the LaPerm is 12 years - generally a long life expectancy.